To what extent do the properties of metal clusters affect the chemical adsorption as the first step in heterogeneous catalysis, and how do they be described? My group has long been devoting to the challenge of discovering an experimentally measurable descriptor for the catalytic activity and, looking forward, to paving the way for the rational design of metal catalysts. Metal catalysts play an important role in petrochemical, pharmaceutical, and fine chemical synthesis, etc. The concepts of "d hole" in band theory and "the number of d-electrons" in the Pauling valence-bond theory have been used to understand the catalytic activities of metal catalysts in some reactions. In recent years, the d-band centre on transition metal has been proposed to describe the adsorption energy of adsorbate molecules on the metal surface. The latter is usually used as a descriptor for the reaction rate. The effectiveness of the theoretical calculation-based descriptor has been verified in several simple reactions, illustrating the possibility of the rational design and optimization of catalysts for the related reactions. 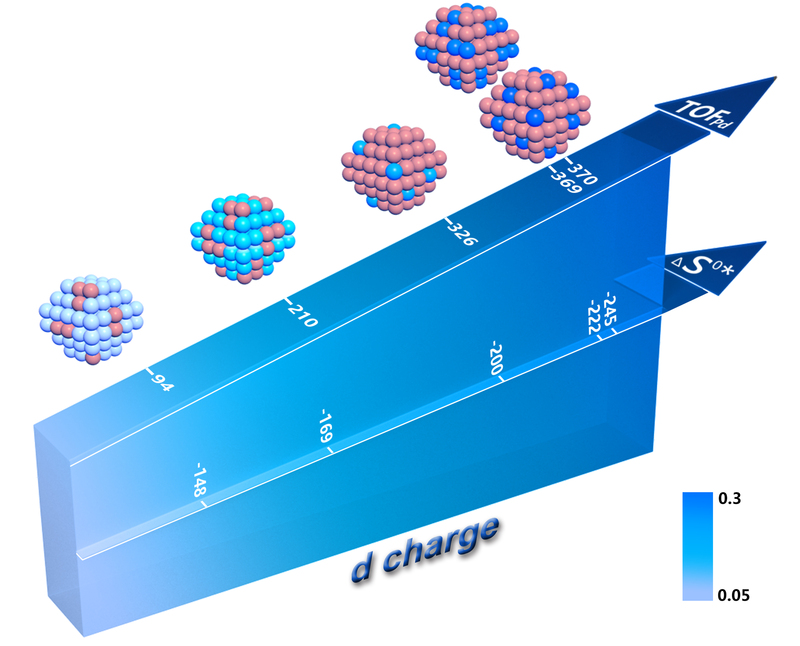 Motivated by the success of the d-band centre model and the derived descriptor, as well as the transition from single crystal studies to more industrially relevant catalysts, we have been seeking a simple and experimentally measurable descriptor that quantitatively correlates the surface electronic structure to the catalytic activity for transition metal alloy nanocatalysts. This study is based on stable monodispersed AuPd nanoalloys whose structural resolution has been determined at the atomic level supported on a less-active carrier, which minimizes metal-oxide interactions as well as particle size and compositional uniformity effects. The nanoalloys are produced by an operationally simple and reproducible method, and this is a novel strategy for AuPd nanoalloys produced by coordination-assisted surfactant self-assembly and adsorbate-mediated reduction to overcome the thermodynamic favourable gold surface segregation to obtain truly uniform and stable Au-Pd alloys on high-temperature heating. The AuPd nanoalloys are embedded in a silica-carbon matrix and adopt an almost identical structure at the atomic level and electronic properties as AuPd bulk alloys with the same compositions. The alloy structure is stable, showing negligible metal segregation, dissolution-redeposition and aggregation during the strong-adsorbate involved oxidation processes. The well-defined nanoalloy structure, in particular, continuous change of the Pd-Au coordination numbers in AuPd catalysts with different Pd loadings, allows for a direct determination of the structure-property relationship. The d-band and non-d (sp, mainly s) charge densities at Pd sites are easily measured by experiment: the measured binding energy shift of the core level between the pure metal and the alloy relative to the Fermi level is correlated with the changes of the Hartree-Fock one-electron energy of the core level which is directly dependent on the charge transfer in the initial ground state, the change in the work function, and the final-state relaxation of a core hole between the metal and the alloy. The maximum d-charge gain is found on Pd single atom and Pd-Pd dimer with about 33–50 at% Pd. Based on transition state theory, the d-charge gain on the surface Pd site has a positive correlation with the standard entropy change (ΔS0*) of active complexes, and turn-over frequency (TOFPd) with a typical example for the base-free oxidation of primary alcohols. The decisive influence of the d orbital which is not involved in metal bonds in a hybrid orbital on the stabilization energy of adsorbed complexes and catalytic activity, is well clarified. Descriptor. The d-orbital charge on the surface of Pd serves as a descriptor to the adsorbate states (the standard entropy change, ΔS0*, of active complexes) and the catalytic performance (turn-over frequency, TOFPd) for the oxidation of benzyl alcohol to benzaldehyde over the AuPd solid-solution alloy nanocatalyst confined by ordered mesoporous carbon with tunable metal ligands of the surface palladium atoms. I’m very grateful to all the co-authors and other collaborators who have supported this project. First of all, I would like to express my special thanks to Professor De Chen of the Norwegian University of Science and Technology. Professor Chen took a one-year academic sabbatical at East China University of Technology last year, which gave me the opportunity to seek advice in person. The discussion sheets with Prof. Chen collected during the past year have been bound into a separate and thick volume. The most impressive discussion is on the core topic of this paper, viz the surface d charge descriptor. Professor Chen repeatedly discussed with me whether we can find an experimentally measurable descriptor for the catalytic reaction. This is the key issue for the rational design of catalysts, especially for industrially relevant ones. This incisive discussion with Professor Chen helped us to finally discover the descriptor. "Perseverance, bronze and stone inscriptions can be engraved" is what I learn from Professor Chen. I appreciate the collaboration on XAFS with Prof. Jian-Qiang Wang of the Shanghai Synchrotron Radiation Facility and Shanghai Institute of Applied Physics, Chinese Academy of Sciences. It has been eight years since the first co-authored paper on coordinatively unsaturated manganese monoxide-containing mesoporous carbon catalyst in 2012. The most important surface d-charge analysis in this work comes from the detailed XAFS analysis. We have 5 co-authored papers. Thanks very much to Profs. Xuezhi Duan, Yan-Qiang Tang and Wenzhao Fu of East China University of Science and Technology for their fruitful discussion on DFT calculations and reaction kinetics analysis. The given name “Yan” literally means a lot of fire in Chinese. It always reminds me of our heated discussion in July and August 2018 under the scorching sun. I would also like to thank Prof. Bingsen Zhang and Dr. Liyun Zhang from the Institute of Metal Research, Chinese Academy of Sciences. When we received the reviewers’ sheet, we noticed that an AC-HAADF-STEM image was required. It was one week before the most important festival in China-Spring Festival. Bingsen and Liyun helped us with the image in two days. I have benefited a lot from the collaboration and discussion on the EM characterization with Prof. Zhang. We have two co-authored papers.